DTP is always fun, also VersaMark resist is impressive all the time. Magenta, Penny Black, Hero Arts, Impression Obsession and you name it! Haiku Bunny from Hero Arts is still my favorite. Trimmer. I can’t make straight cut by hand, LOL. Don’t be scare for making mistake. Taipei. I visited there last summer once. There’s stamp shop here and there. I have my local stamping group exchanging cards monthly for about 15 years. Also I’m a member of Artist In Residence (design team) of Tsukineko/Imagine Crafts. Not recently, but I’ve been published on VSN, Stampers’ Sampler, Scrap and Stamp, Take Ten, Somerset Studio, etc. Haven’t done for long time, used to do sewing, tole-painting and quilting. Nature. Sky is amazing art all the time, trees, flowers, ocean, river, all these colors and textures give me creative juice. Not much. I learned by myself. A lot! LOL. Shaving cream, bleach, rubbing alcohol, rubber balloon, etc etc. 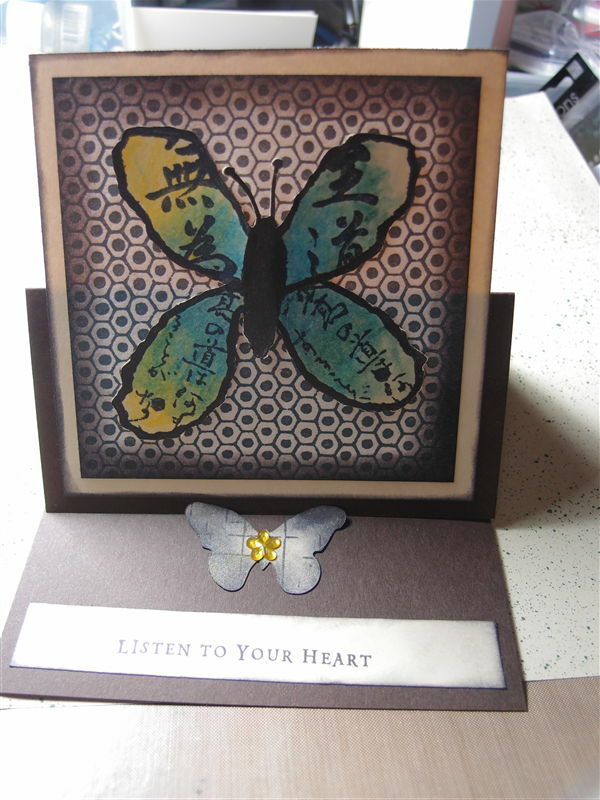 I go Pinterest and searching artwork, or Splitcoast Stamper is also inspiring. Stamping is my job right now. 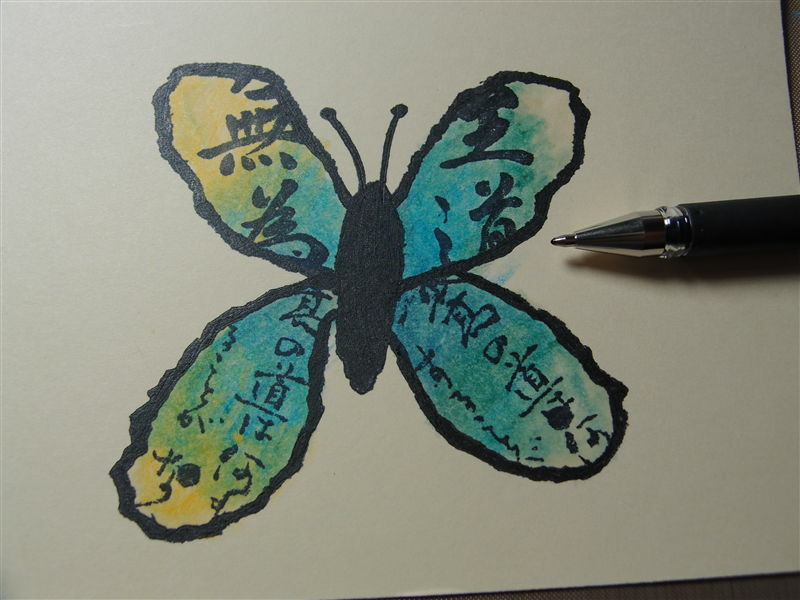 Stamp Butterfly with Memento Tuxedo Black Ink. Color with colored pencils. Blend color with VersaMarker. Sponge Memento Tuxedo Black ink to the edge of each panel with sponge dauber. 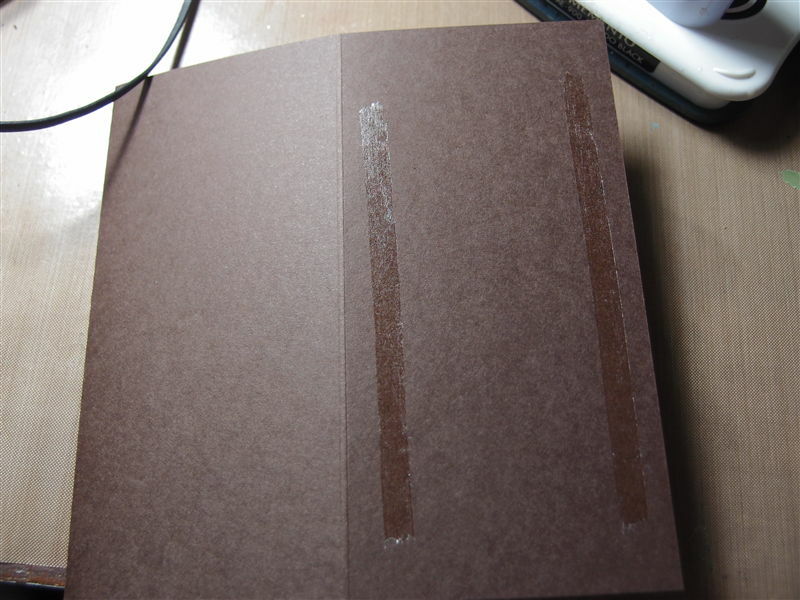 Fold 5.5″x11″ card in half, then 2.75″ again. Apply glue to end area. 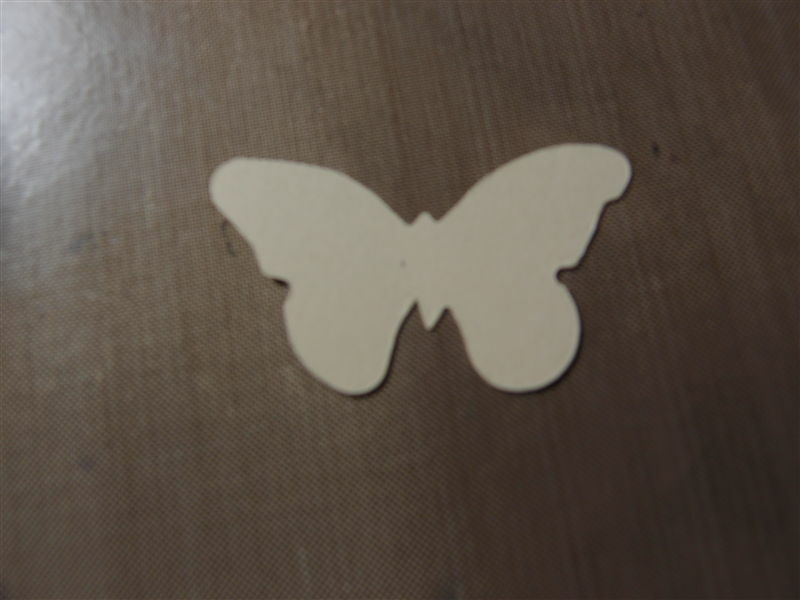 Stamp butterfly cutout (dye cut); then adhere to the inside to the card. Apply rhinestone on the butterfly. This will be the stopper for easel part. 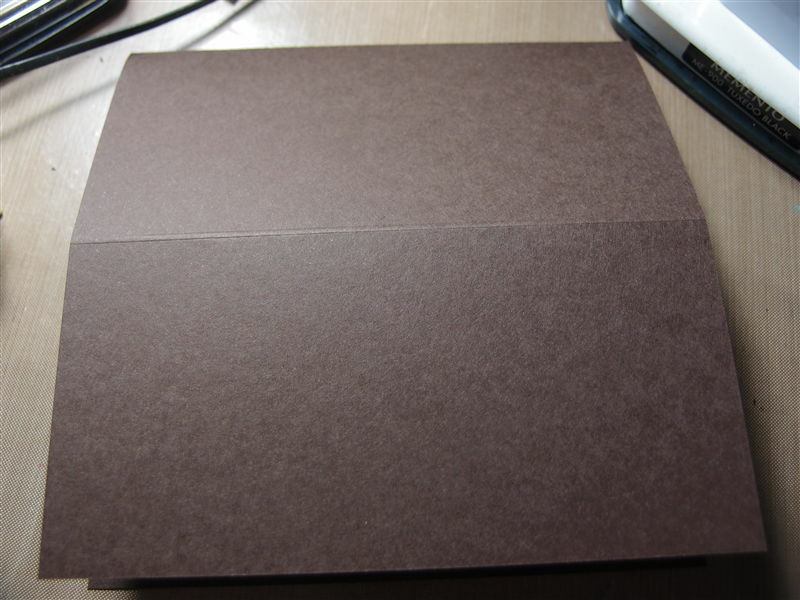 Stamp phrase to narrow cardstock; then adhere. 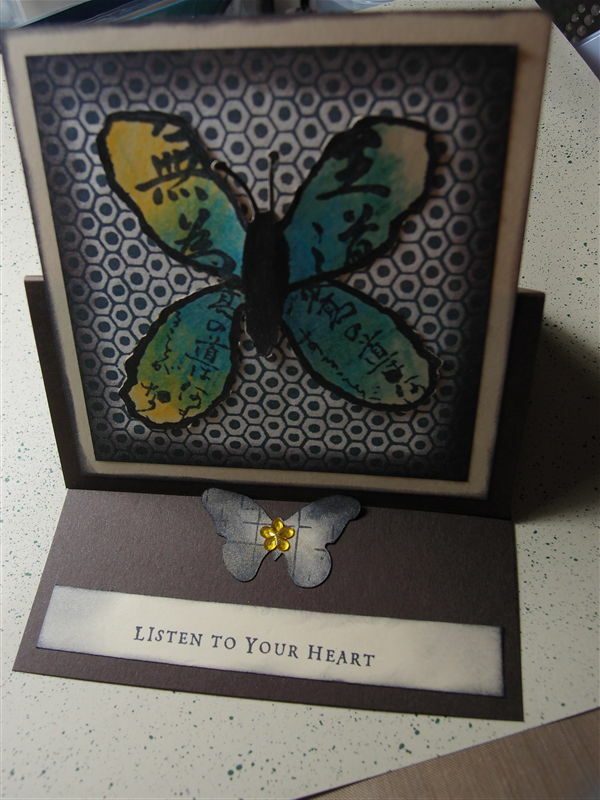 Wonderful easel card you made Kazuko and congratulations toooo! 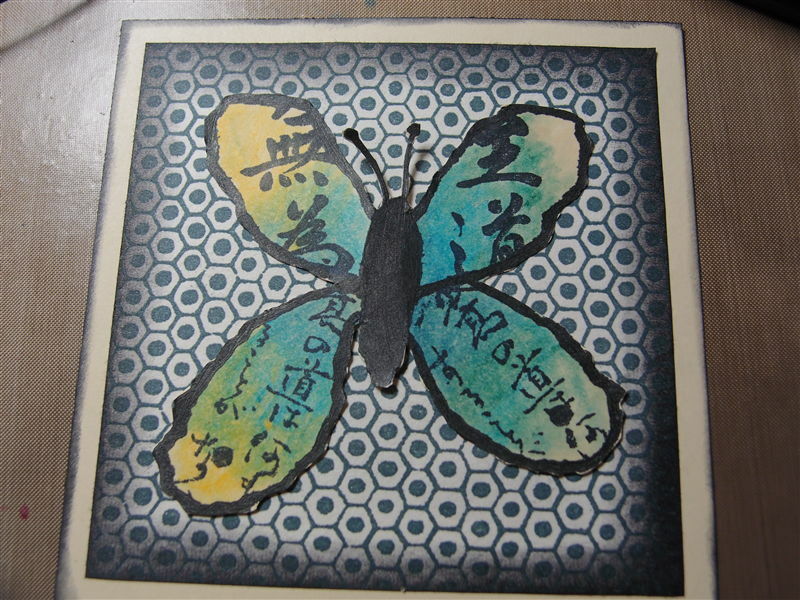 Congratulations Kazuko…enjoy your month as Stamp Artist of the Month! Thank you Kazuko for the great. ATC swaps you hosted years ago. Well deserved…Congrats Kazuko!!! Enjoy your month as SAM!!! Congratulations Kazuko! Your project is beautiful! Enjoy this month as SAM! Enjoy your month as SAM. 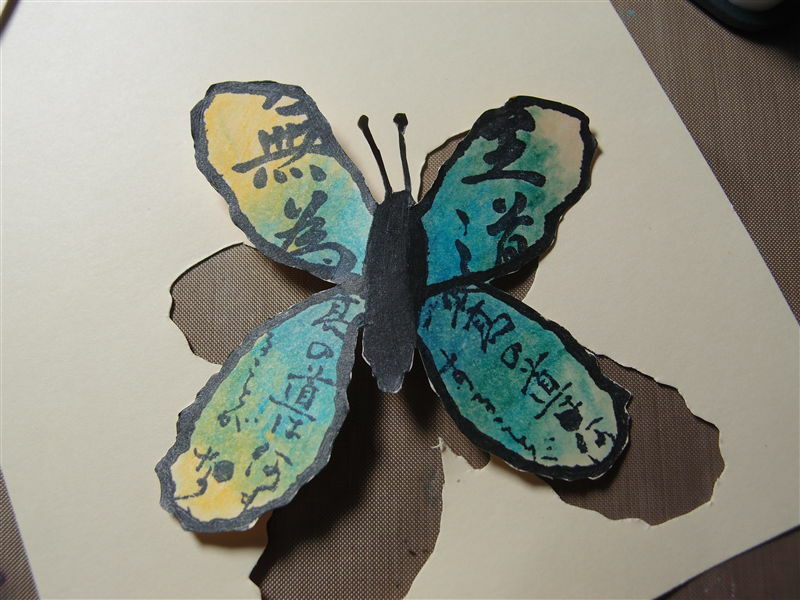 Kazuko, you created a beautiful buttefly for your project. I love it! 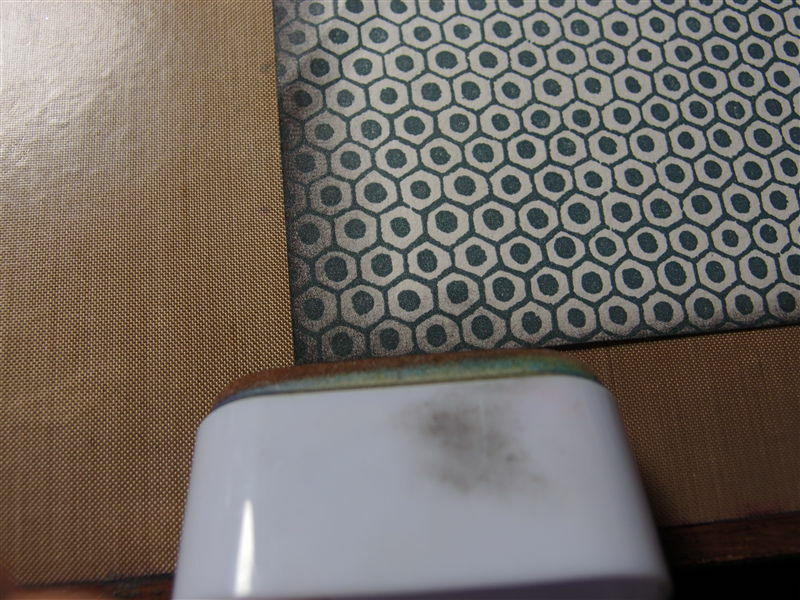 Over the years you have provided us with inspiration and tips for stamping. You deserve to be our first SAM for 2013. What a beautiful project! Absolutely gorgeous! I have enjoyed reading your bio too! Well deserved on becoming this months SAM. Enjoy! Beautiful card- love your colors! It is fun to read about you- congrats to you for being names SAM! Congratulations and I enjoyed your bio. Love the butterfly easel and the colors you chose.Enjoy the spotlight.